After only five months of kicking-off operations at the Dominican Republic’s Pueblo Viejo gold deposit, one of the largest in the world, Barrick Gold (TSX:ABX), (NYSE:ABX) announced Tuesday the mine has achieved commercial production. "This is another major milestone at this truly world-class mine," said in a statement Jamie Sokalsky, President and Chief Executive Officer of Barrick. "We are pleased to have successfully completed Pueblo Viejo last year, in line with guidance, and now also to have reached commercial production," he added. The operation, said Barrick, is expected to support about 2,000 direct jobs plus nearly 10,000 indirect jobs over the 25-year mine life, with Dominicans accounting for nearly 90% of the full-time workforce. In a separate statement, Goldcorp said its forecast share of 2013 gold production from Pueblo Viejo is expected to be between 330,000 and 435,000 ounces. In its first full five years of operation, Goldcorp's share of annual gold production is anticipated to be between 415,000 and 450,000 ounces. 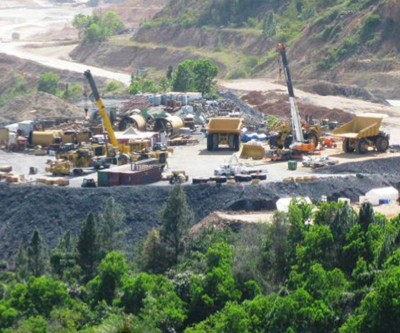 Since 2008, Pueblo Viejo Dominicana Corporation (PVDC) has invested over $7 million in projects to improve healthcare, housing and literacy and allocated a further $75 million to remediate environmental impacts from a former mining operation on the site. The Dominican Republic has attracted a lot of attention from miners recently and according to data published by the country’s geology society (Sodogeo) last year, the Caribbean nation is sitting on nearly $58 billion of unexploited reserves of minerals and metals.